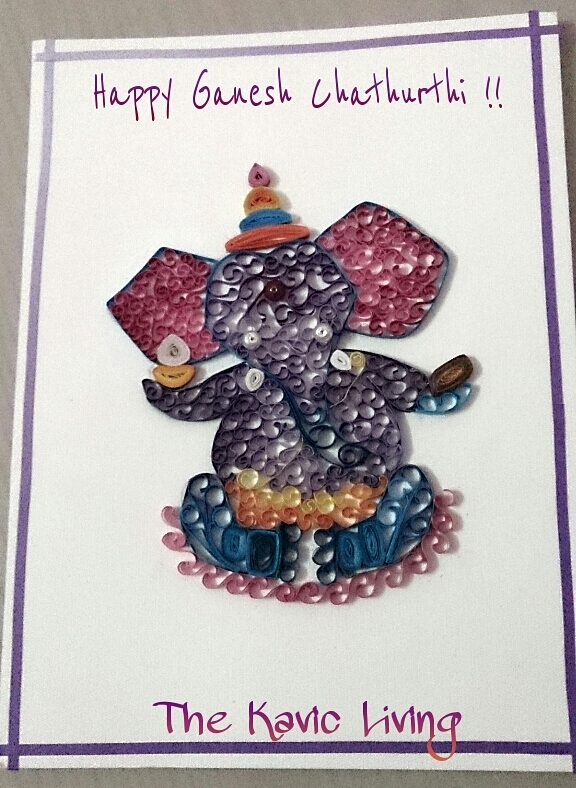 Quilled Baby Ganesha for Ganesh Chathurthi!! I wanted to try something different with quilling, rather than the same floral patterns. While browsing for different techniques and patterns, I came across many video tutorials by various quilling artists across the world. Managed to learn two new techniques from http://quillingmesoftlee.blogspot.in/ - Beehive technique and the leaf technique using a comb. It's Ganesha week here in India... you can see colorful ganesha idols everywhere on the streets. It's the most cutest God form I've ever known. He brings a smile to your face whenever you see him. So I thought of making a ganesha with the quilling techniques I know so far. I drew a baby Ganesha on a card, bringing in some qualities of Krishna in Ganesha. (Thats why i chose blue for most of the parts). I had only graduated strips at home and limited color stock. Had to mix up some colors to finish this piece. Hope you liked my creation. Ganapathi Bappa Moriya :) I was so happy seeing my baby Ganesha completed... Planning to frame and hang it in our living room. Quilled baby Ganesha - Used pearls and beads to decorate. Hope you are inspired to Quill something new!! I planned to make a card for her, but did not have any specific design outlined in my mind. I just started with basic flowers, tried out different shapes and techniques for the leaves. I learnt to glue things without much fuss. I used my own technique for the two big leaves with veins. The curled strip came out very well, that's the highlight of this card. I had some graduated strips in stock, so used most of them in this piece. Graduated strips are nothing but two colored strips... from light green to dark green. 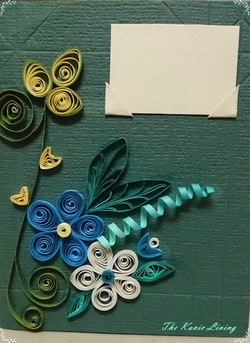 Thought of quilling the letters like MOM and develop on it, but was very skeptical about properly packing it with care and sending the card by post. So I tried out this photo/card holder instead. You can place any message on it or place a small photo of your loved one and frame this card, makes a good wall piece. What is quilling all about? Quilling is an intricate artwork with paper. Rolling a strip of paper and making shapes is called quilling. Easy Peasy right? Sometimes I really wonder who found this as an art by itself !! But there is lot more to it... You can create great master pieces with quilled shapes, which many of the fellow quillers have proven across the world. You can make photo frames with quilled art, quilled jewellery which is catching up everywhere now, quilled cards, decorative findings, 3D art and many more. Options to create out of quilling is endless but you need a lot of patience for this art. You don't need much of an investment on tools and kits to learn this craft. You just need a quill, which is a slotted pen to hold and roll your paper and some paper strips (standard size of strip width - 3 mm, and gsm - 100 to 120) to start with. You can well make your own paper strips at home. Start rolling your strips and making shapes as shown below. Then you can start making flowers and other art using those shapes. 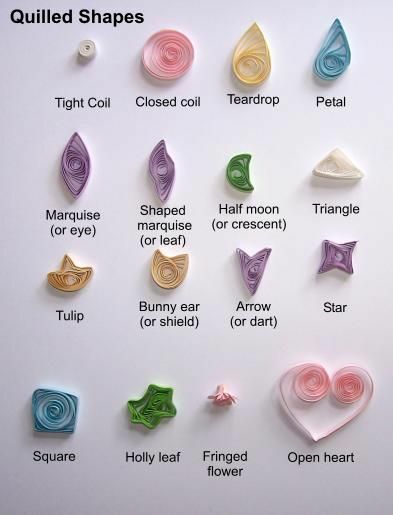 Once you get your basics right, you can learn some of the advanced quilling techniques like spiral roses, quilled spirals, fringed flowers, crimped flowers, alternate side looping, husking, comb quilled shapes, three dimensional quilling, etc. Types of Quilling strips available - Plain/solid color, Graduated, Two tone, Pearl, Metallic, Acid free and many more. Get inspired to quill by following our quilling pinterest board. Practice makes a man perfect... So start quilling and practice until you get your art in the perfect shape you wanted. 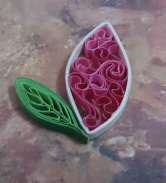 I have just started quilling... will update on my quilled projects here. Till then happy Quilling guys! 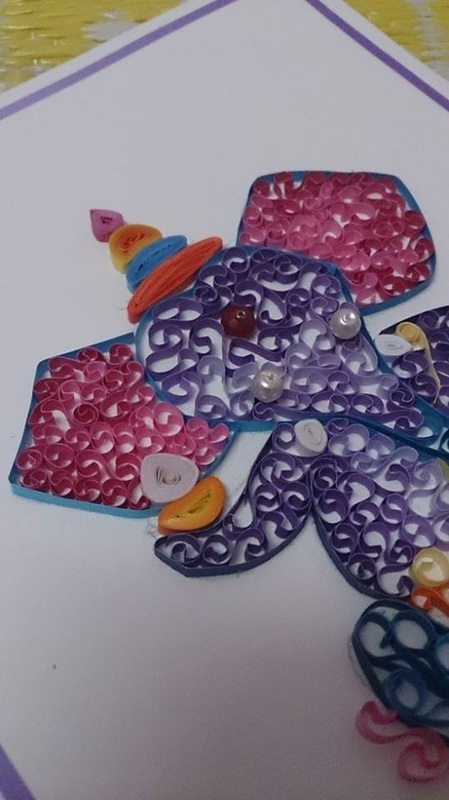 Kavi shares about her new hobby and her journey in learning the art of quilling.